CROSSFIT ARSENAL AT CRASH B’s SPRINTS!!! 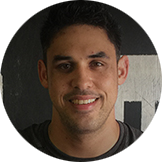 Jason Gee has been CrossFitting for a decade and is an award-winning coach who specializes in Olympic lifting, flexibility for performance, and movement fundamentals. Passionate about all types of mental and physical training, Jason loves "seeing our members unlock a new ability or capacity that they didn’t know they had. I say it that way because I honestly believe that people are capable of so much more than we realize, we just need the right tools to find our way there. There is nothing more rewarding than helping empower people become the strongest version of themselves." With an athletic background primarily consisting of combat sports, wrestling, boxing, Thai kickboxing, MMA, Brazilian Jiu Jitsu and no-gi grappling, Jason was active in all of these sports for over 15 years. He has competed extensively and even spent six months living and training Brazilian Jiu Jitsu in Rio de Janeiro. He has also been utilizing kettlebells in his training for almost 17 years. His awards include Guinness World Recorder Holder "Most Weight Moved by Kettlebell Swing 1-Hour" and Georgia Games Heavy Weight Boxing Champion 2006, with numerous submission grappling tournament victories at an advanced level. Jason started CrossFit 10 years ago at CrossFit Atlanta, when the space was a 1000 sqft garage attached to a welder house next to Ga Tech. "At the time, I was just looking for a way to enhance my conditioning for my sport competition," he says. "I had already been doing similar workouts on my own, but once I started training with a program, everything just went to another level. I continued to compete in combat sports for another 4 years after finding CrossFit before finally making the jump in 2011 to becoming a full time trainer. 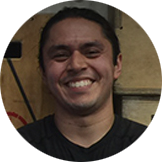 After years of training in competitive programs (which were great), I was really ready to be a part of something that was for everyone, and I think that is what we have built at CrossFit Arsenal." When not in the gym, Jason can be found hanging out with his two little dogs Marcus and Ekho, and wife Anli Jiao (who is also our office manager). Billy Gamble is our yoga instructor, coach and self-proclaimed "King of the Open Gym." He has been a CrossFitter for six years and specializes in yoga and weightlifting. "I love giving people the best hour of their day," he says. "Sharing my excitement for fitness with members and students is great." Billy played lacrosse in high school and was the captain of the team. "I played goalie," he says. "I played intramural dodge ball for a while in college, too. I now compete in weightlifting whenever I can." His path to coaching came after working in the music industry. "In 2012, I had just left my job working in the music industry and working in bars. I’d been CrossFitting for a while and was enjoying doing yoga. In the fall of 2012, I started teaching yoga part time, and shortly after that, I began coaching CrossFit at my gym. I’ve been working in fitness full time since the winter of 2015." When not in the gym, Billy enjoys attending underground metal shows, watching football, and hanging out with his girlfriend and their two cats. 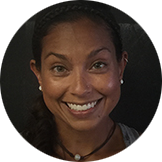 Christine Koesler has been CrossFitting for five years and she is passionate about getting people addicted to fitness! She highly values proper form while training and she is always willing to have conversations about nutrition. Christine loves getting our members excited about fitness and watching their excitement grow when they learn a new move or get a PR. One of the greatest things about CrossFit Arsenal is the fact that newcomers are always welcomed and encouraged. This is especially the case for Coach Christine, as she loves working with beginners! When Christine isn't in the gym, she is on set - acting or modeling for clients like Hasbro, Amica, Citizen’s Bank, CVS, TJ Maxx, Ocean Spray, and Dunkin Donuts. Christine booked her dream job when Reebok asked her to do a photoshoot! Here are a few more things you should know about Christine - She likes to hang out with a little black bunny named Oliver. She believes in active rest days and mermaids. Her favorite move is the Handstand Pushup. Her favorite lift is the Clean & Jerk. Her favorite cardio is anything that isn't rowing. Lastly, she believes pushing your limits should be empowering... not scary! Seth Rowsam has been CrossFitting for four years and especially enjoys training to be a better competitor (pacing, movement cycling, keeping HR down, planned breaks, etc.). "I’m all about constantly making myself and those around me better each and every day, no matter how small or large the difference may be," he says. Maybe that’s why he most enjoys watching a member break through a barrier or plateau that they have been struggling with. An athlete who has played just about everyone sport for some time as a child—with a focus on hockey—Seth focused his energies on hockey and lacrosse from middle school through high school. "After high school, I played three years of Junior B hockey (one year in a Northeastern American League, followed by two years in an Ontario, Canada league). A year of junior college lacrosse also happened." During his senior year in high school (2007), his strength and conditioning coach had begun experimenting in using CrossFit with some of the athletes who frequented the gym. Years later, he walked into the old high school stomping grounds one evening to "get blasted by some CrossFit workout that I wish I could remember—and was hooked!" Funny story: "One of my first CrossFit workouts after going full speed into it, I tried to keep up with the gym's top dog...a bad move. It was a very large volume of bench press followed by a push-up/pull-up ladder. A few days later, I was pretty well swollen in my chest region. Then it got even more swollen, to the point where it looked like I was smuggling grapefruits. Too embarrassed to come in to the gym to get some recovery tips and assistance, I was MIA from the gym for a week and a half until some of the swelling went down. Proper recovery then began after some good laughs about my ridiculous attempt to beat a well-groomed athlete in my first few weeks of rookie status." 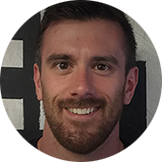 Adam has been CrossFitting since 2016, and has trained with a focus on strength and conditioning since 2009. He specializes in developing gymnastics skills and general work capacity. One of Adam’s favorite things about CrossFit is the fact that once a new skill “clicks” with an athlete, their entire attitude about it changes. “Initial fears about learning a new skill are immediately forgotten once an athlete picks it up - that apprehension becomes enthusiasm, and it’s enthusiasm that keeps us all motivated to improve,” he says. Adam’s sports background is in wrestling, ending his athletic career in high school as a qualifier for the New Jersey State Wrestling Tournament in Atlantic City. He continued on to the United States Military Academy at West Point where he studied Electrical Engineering and Mathematics. During the day Adam is an active-duty Army Infantry Officer and a graduate student at Harvard University. Jamie Brause has been a CrossFitter for five years and specializes in kettlebells, Strongman and "circus skills." He loves studying "superficially different disciplines and learning and exploring what they have in common. I love seeking out experts in a field and learning everything I can from them. I also love when I’m able to help foster a real enthusiasm for training in members. Whether that’s in CrossFit or something like weightlifting or powerlifting, when I give them a lead and then they take it and run with it, that's very exciting to me." Jamie’s athletic background includes track and field plus wrestling in high school, as well as 25 years in skiing. 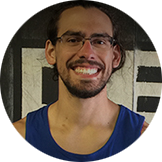 He was president of Boston University’s Capoeira Club and came to CrossFit after getting a degree in philosophy in college. "I was trying to get on the Boston Fire Department, and while waiting for test results to come in I became a member at a CrossFit gym," he says. "When I couldn’t afford my membership anymore, I started coaching." When he’s not CrossFitting, you can usually find Jamie near a mountain in the winter, an ocean or lake in the summer, and somewhere trying to learn woodworking when it’s raining. He lives by a simple philosophy: "Be entitled to nothing, and grateful for everything." 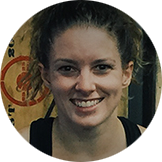 Julie Glover is our weightlifting coach and has been a CrossFitter for eight years. She specializes in Olympic Weightlifting, and has been involved in USAW Olympic Weightlifting since 2010. "I founded Wilmington Weightlifting Club that same year and trained under Tony Cowden USAW Club Coach, and then with Camillo Garcia Former Cuban National Club Coach and Danny Lopez-Calleja at Miami Team Soul," she says. "I competed for a few years, but I found my true passion was working with fellow athletes, helping them learn the sport and excel at technique. This is not an easy sport and results do not come overnight, but if you are willing to commit, focus and work on technique the results stay with you for life." Julie loves helping members achieve more than what they thought they ever could, whether that is a first pull up or maxing a lift. "I feel like I need to pass down the confidence my early coaches instilled in me when I needed encouragement," she says. As an athlete, she grew up very active in watersports like wakeboarding, windsurfing, and scuba diving. "I stayed fit, but when I was around 35 years old, I got to where I could barely run a mile. That is when I discovered CrossFit. It was life changing for me, as it provided a positive outlet and positive associations that I needed at that point in my life. No matter where I live or how often I travel, I can find a box and integrate myself." When not in the gym, Julie enjoys hiking the "whites" with her dog Mia, international travel and searching for her dream retirement villa. Emily has been CrossFitting for four years and specializes in running and endurance. She specializes in developing durable performance athletes with a minimal investment of their time. Passionate about CrossFit (of course), traveling, her dogs and running, Emily loves seeing how quickly people progress. "One week someone can barely get a pull-up, and the next they are stringing three together," she says. A runner for more than 17 years, Emily has competed in college and has won a number of local races. "I am a Boston qualifier and competed at Track Club Nationals as an adult," she says. "I love doing local competitions and spending time in the gym. The people and community feel are some of the best things about the gym. I love interacting with our members and seeing new members fall in love with CrossFit. I decided to take the Level 1 to allow me to work with our members directly." Emily’s day job is at Harvard Medical School, but outside of work and the gym, she loves to do anything outside and is always looking for another trip to plan. Try an introductory workout, learn about our classes, coaches and programs, or come in for a consultation for FREE.. Open to all fitness and experience levels. We'll contact you to schedule a time that works for you to come in.